Water Damage from Hurricane Irma on high rise condo in Fort Lauderdale Florida. Our Public Adjusters reopened the claim in November of 2018, after the denial and settled with the carrier in less than 60 days without a lawsuit for $63,000 after deductible. The experts at Florida’s Best Public Adjusters represent the rights of the clients! The insured client filed a claim for floor damage in a high rise condo. Universal Property and Casualty denies the claim stating that the cause was cleaning products even though a floor expert stated that was not the reason. 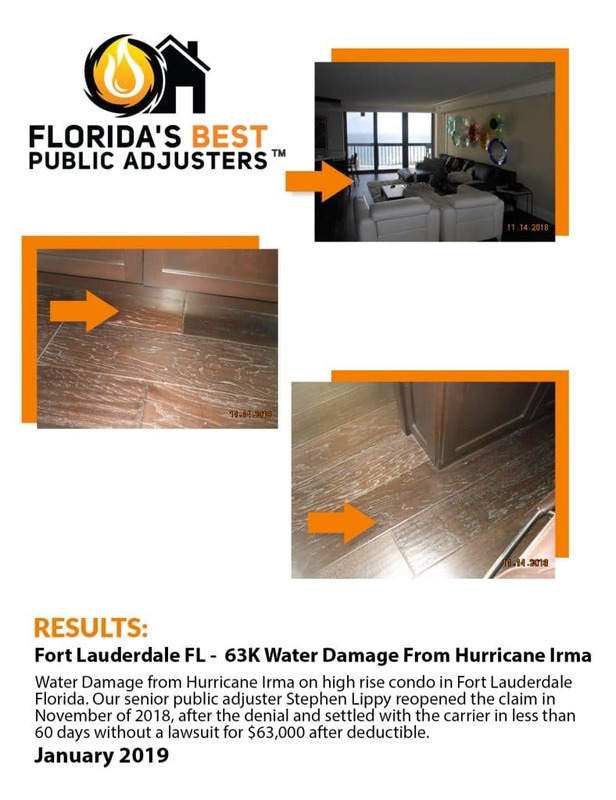 The client called Florida’s Best Public Adjusters – Fort Lauderdale for a free consultation. Our senior public adjuster Stephen Lippy, felt after interviewing insured, reviewing the experts assessment and studying the slope on the floor in from the living room sliding windows that the water intrusion was caused by Hurricane Irma forcing water into the unit and reopened the claim as a hurricane damage claim. When he asked the client why they did not tell the adjuster from the carrier about moping up the water blowing in through the sliding windows, the answer was, “we were never asked”. Our expert public adjuster reopened the claim in November of 2018 after the denial and settled with the carrier in less than 60 days, without law suit for $63,000 after deductible for water intrusion from Hurricane Irma in 2017.